Greg Collins, Margot Whittington, Chris Whelan, Gordon Dunbar, Jackie Omedei, Matthew Podesta with Peter Zambotti’s Award, Trish Halvorsen, Bert Giancristofaro, Michael Jackson and the Hon. Dean Nalder. 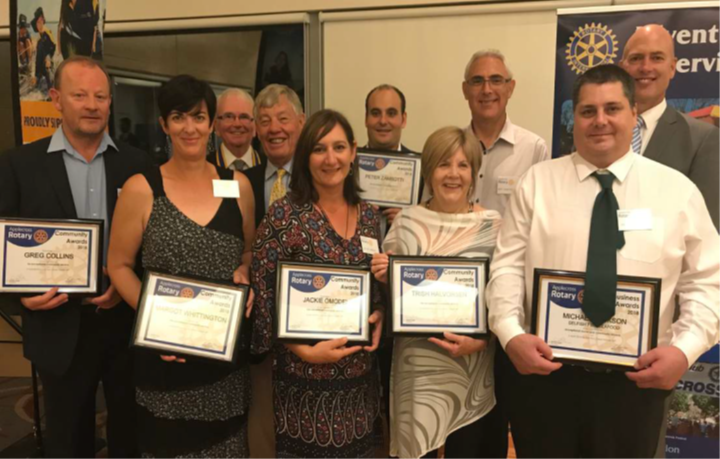 The Annual Applecross Rotary Community and Business Awards evening at Tompkins on Swan on 3 April 2018 recognised seven people for their work in our community. The citations were read out by the organiser of the event, Gordon Dunbar. The awards were presented by Acting President Chris Whelan, and local MLA the Hon. Dean Nalder. More details are available on this website at http://applecrossrotary.org/stories/2018-community-and-business-awards.